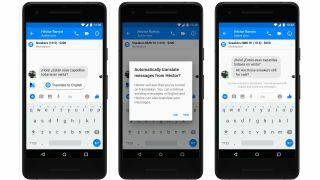 Facebook’s new AI assistant, M, can now translate your Messenger conversations from Spanish to English, or vice versa, with the tap of a finger. All users in the United States or Mexico should now have access to this option. If any user sends you a message in a non-default language, the AI will recognize it and offer to translate the text to Spanish (or English). If you say yes, M will then offer to auto-translate all future foreign-language messages in that conversation. Facebook first debuted M Translations back at the F8 2018 Conference in May, but only in the Marketplace. Sellers and chatbots can use M Translations to connect with more customers in foreign nations. Now, making virtual pen pals via Messenger with people from other nations just became a whole lot easier – well, assuming Facebook’s AI is as good as Google Translate at translating nonnative speech naturally. Facebook claims that it has plans to launch M Translations in other languages and countries, but hasn’t given any timetable on when or where that could happen. The M AI currently works in five languages and eleven countries, mostly English- or Spanish-speaking. Britain, Canada, Australia or Spain could all be future candidates for inclusion. Brazil and Portugal also have access to M Suggestions. Eventually, Portuguese-to-Spanish and Portuguese-to-English could be next on the agenda. Facebook is in the midst of some major changes to Messenger. Along with its AI additions, it plans on autoplaying video ads in Messenger to make more money off of the platform. It also added augmented reality tech to Messenger, as a way for businesses to show off 3D models of products for people to buy. Facebook’s preoccupation with translations may also have to do with its plans to launch its smart speaker in a non-US market. If the US-based company decides to launch in Spanish-speaking countries, for example, then the ability to communicate with users across language barriers could be vital to the launch’s success.